I don't know about you, but I'm a savoury breakfast person. I always forgo piles of delicious, fluffy, buttery, syrupy pancakes in favour of something more 'healthy' like, erm, bacon and eggs. The sugar = white death argument has taken its toll and pancakes just seem a little bit too naughty. So, you can imagine my delight when I uncovered a stack (groan) of delicious and nutritious pancakes at some of the best cafes in Melbourne. I'm a-switchin', folks—this week I'll be dining from this list of the best healthy pancakes in Melbourne. Gluten free and vegan, this freaky twist on flapjacks at Abbotsford's Admiral Cheng Ho features organic quinoa pancakes, served with candied orange, Lotus Solkiln Geisha (Ninety Plus Estate) coffee soil, raw vanilla cream, and butterscotch sauce. Ok, so maybe not 100% healthy, but quinoa's a supergrain, dontchaknow? I saw these float past my table on a recent visit to Addict, and these pancakes make healthy look oh so gooood. Made from wholemeal, they're like totally low GI so will keep you full for yonks. Thick and fluffy, they're served with mascarpone and poached quince. Plus, Addict serve up some of the best breakfasts in Melbourne, so you can't go wrong with whatever you order. Gluten-free and vegan, the buckwheat apple pancakes at Monk Bodhi Dharma come with a serve of cinnamon ice cream, maple syrup, vanilla bean whipped cream, and dehydrated apple chips. An apple a day, right? Keep calm and chow down, cavepeople; these delicious pancakes are 100% paleo friendly! Richmond's newest paleo cafe, Patch, has a breakfast menu bursting with healthy options, but we're going straight for the paleo pancakes, made from 'nana and almond. They're served with candied walnuts, maple syrup, thickened lemon yoghurt, and blueberries. Nom. Image credit: Little Big Sugar Salt Facebook. LBSS's take on healthy pancakes is described as: gluten-free almond and berry pancake bits with dairy-free coconut icecream and sugar-free date syrup and a bit of fresh fruit. Um, yum. Raw vegans needn't be relegated to the green smoothie stand when it comes to brekkie time. The super healthy banana pancakes at Northcote's Shoku Iku are topped with fresh fruit, raw and activated nutella, and plant-based cream. For healthy pancakes on the go, the paleo pancakes at Paleo fast food outlet, Thr1ve, tick all the boxes. Order these and you'll receive a delightful stack of mini Dutch pancakes made from coconut and almond flour, free-range eggs, and a dash of maple-syrupy goodness. Sprinkled with cinnamon and organic honey, you can also add a few slices of banana to fuel you through the working day. If you can hold off on your pancake craving 'til midday, Yong Green Food has two super healthy pancake offerings, of the more savoury variety. The Korean kimchi pancake is chock full of probiotic goodness (find out how good fermentation is for you, right here), and comes served with soy mayo. If you're fanatical about fungi, go for the organic buckwheat crepe with braised shitake mushrooms and wasabi soy mayo. As you can see, forsakin' bacon ain't a chore; there's a pile of healthy pancake options in Melbourne! 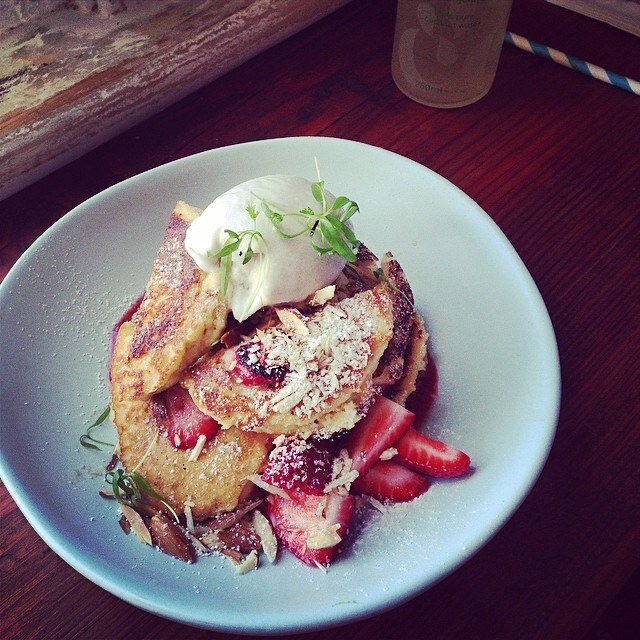 On the hunt for more of the best breakfasts in Melbourne? Click here!